Steve and Maggie organised the May ride where 8 tandems and 2 solos met for coffee in the old railway station at Okehampton to ride the Granite Way and explore a loop of southern Dartmoor. The weather forecast of sunshine and showers was half correct, the sun appearing in the last couple of miles of our homeward leg. Despite the weather, the visibility was good and we had stunning views of a moody Dartmoor. The heavy showers arrived soon after the ride started and by the time we got to Lydford the thought of a warm, dry pub lured several couples. By this time we had already lost 2 tandems (how, we don't know) so 3 tandems and a solo continued a lumpy ride around Brent Tor (the church on the hill) to the pub at Peter Tavy for lunch. The lost tandems appeared separately at the pub and 14 of us had a very enjoyable lunch. Having regrouped, 5 tandems set off on our homeward journey. The route between Peter and Mary Tavy was more off road. Here we unfortunately met a farmer in a Land Rover who very kindly reversed 200 yds back up a narrow, twisty lane. After that the path became very rough and we walked a short distance. Leaving Mary Tavy we skirted around the edge of the moor and joined the road back to Lydford. This road had a sting in its tail with a steep, short climb into Lydford, but then through the old village to rejoin the Granite Way and back to Okehampton. Steve and Maggie were trying to claim the title for the wettest ride, but Nick and Rachel can still hold on to it!! Andy and Anita organised the June ride where 4½ tandems enjoyed an extremely hot ride over some of Devon's rolling hills. They were joined by Mark and Liz, Steve and Maggie, Chris and Chris and their daughter Yasmin, on a solo bike. The temperature reached 29 degrees in places, so sun block and plenty to drink was the order of the day, this was in marked contrast to last month's ride where the rain was the abiding memory of the day. As our ride progressed through the narrow lanes we encountered, amongst other things, a horse and trap and on the whole some very considerate motorists - we even had a tractor and trailer reverse for us! It was quite bizarre to watch Chris and Chris on their electric tandem, with their independent pedals, totally out of sync as they powered up the hills. We had a tea and cake break at Kirsty's Kitchen in North Tawton, lovely home-made cakes, yum yum!!. Kirsty even stayed open late for us - much appreciated and highly recommended. We made our way back over Staddon Moor, with spectacular views of Dartmoor and the recently completed Den Brook wind farm and then on to Bow, where we stopped outside the church for a drink and a natter. The climbs were now behind us and we had an easy ride back to the Waterbridge Golf Club, the only impediment to our progress were the cows crossing the road near Copplestone, they held us up for a couple of minutes as they ambled across the road on the way to be milked. As we'd pre-ordered our food before we set off we only had a short wait before a well deserved lunch. Thanks everyone for their company, we look forward to our next ride together. 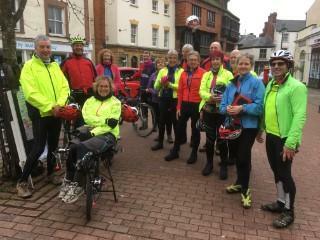 Malcolm and Grace organised a joint July ride for both the West Country and Taunton Groups where 10 tandems, 2 solos and 1 recumbent solo met for this friendly outing. Starting at Puxton Park near Weston super Mare heading out through the villages of Banwell and Sandford then stopping at Heathers coffee shop in Congresbury for elevenses. Suitably refreshed heading then through Claverham and across the levels eventually arriving at Clevedon Sea Front for our Lunch stop overlooking the sea. After lunch we toured Clevedon harbour, then through to Yatton where we picked up the Strawberry Line through to Sandford. The pace quickened and a small group managed to break away from the peloton surviving to the finish line at Sandford railway bridge (been watching too much TDF me thinks). A short stop to admire the leaning tower of Holy Saviours church in Puxton and then it was just 2 miles back to the car park and home. Nigel and Mercedes organised the August ride where 10 tandems and 2 solos met at Barnstaple railway station. Some members of the Tandem Club might be familiar with the Tarka Trail in North Devon where much of the route is on old disused railway lines. It is flat, with a good surface and is popular with cyclists and walkers. The problem is that it usually follows deep wooded valleys and consequently it's difficult to do a 'round trip ride' that avoids tandem 'unfriendly' hills. The August ride for the Taunton Group tried to achieve this. The Old Bideford Road was the route out of town which led us via unclassified roads over the hill with a couple of long steady climbs and back down to sea level at Bideford. The sky was blue and it was perfect cycling weather. We then had to climb again out of Bideford with another steady hill to Gammaton Cross. If there was any muttering of discontent about the hills, I didn't hear it and I didn't quite think it was necessary to hide in the bushes whenever the group stopped. We joined the Tarka Trail at Weare Giffard in the Torridge Valley and this was a very steep descent. Lunch at The Cyder Presse at Wear Giffard and then it was the Tarka Trail all the way back to Barnstaple but stopping for tea and cakes at the Fremington Quay cafe. En route there are a few gates etc which require a little more care to negotiate than on a solo bike but the tandems can be wheeled and no heavy lifting is required . So in total it was 29 miles and 1130 ft of climbing which was all in the first half of the ride. John and Judy organised the October ride with the Taunton Group starting from the Bocabar Café in Glastonbury. A beautiful autumnal Sunday drew a record-breaking 16 tandems and 3 solos out to cycle the Somerset levels on a 30 mile circular route from Glastonbury to Castle Cary, riding twice past (but not up) iconic local landmark Glastonbury Tor. A delicious lunch in Castle Cary was followed by an impressive group photo outside the historic Market House. The Taunton Group had a short ride planned for the day of their Christmas meal which was organised by Ian and Lisa but the weather was so bad that it was shortened to just three and a half miles! Only 3 couples agreed to tackle the challenge – a ride up the hill to Peter Merson’s house where he kindly supplied coffee and a slide show of his early tandeming years. We also saw Peter and Jenny’s pictures of Salviac. The Christmas meal for 39 Tandemists at the Walnut Tree was up to the usual standard and the Christmas quiz was followed by the prize for the best fancy dress – awarded this year to Nick and Rachel. The trophy for the couple who had attended the most rides was awarded to John and Judy. Nick then led us in song to the ‘French’ version of the Tandemists anthem ‘Daisy Daisy’ which the Taunton Group had sung previously in Salviac. Lisa and Ian were thanked for their work as ROs and presented with a bottle of wine and flowers. 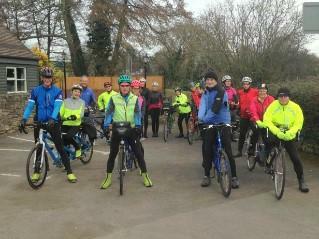 James and Liz organised the January ride where ten tandems and 5 solos met at Combwich just outside Bridgwater. It’s rather fitting that the attached photo is taken in the pub - it was only a short ride and the weather wasn’t really on our side, but the majority of the ride was spent in the pub as the food took for ever to arrive! Lovely people, as always, and an interesting part of Somerset to explore but maybe the constant inhalation of fumes from Hinkley Point Power Station slows the cooking somehow. And they ran out of peas!